I got two things for Christmas, an Instant Pot and a Cricut Explore Air 2. Both of these devices come with a bit of a learning curve. I have figured out the Instant Pot. Now it’s time to tackle the Cricut. I initially wanted a Cricut so I could make my own planner stickers. I would also like to start making cards. 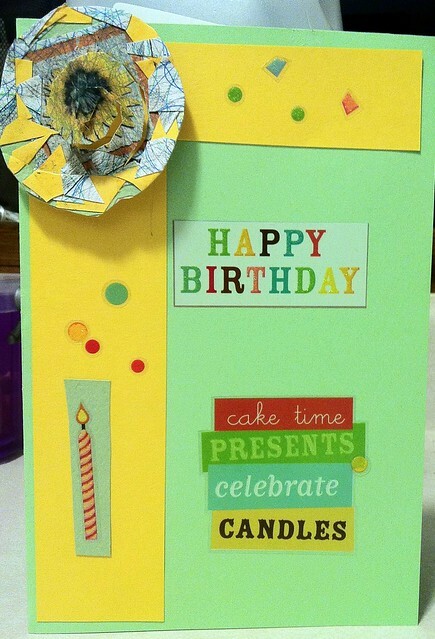 I love handmade cards! I made this card without a fancy cutter. I want to up my game! In the interest of full disclosure, I’m announcing that I’ve signed up for ShareASaleand I am now an official Cricut affiliate. So, if you’re looking to get crafty with one their cutting machines, please do click one of my links. I have already designed a bunch of stickers. Next step, learn how to make them real. There are lots of instructional videos for making stickers on YouTube. Maybe I can make one of my own some day. I’d like to be flawless. That sentence was the first thing that came to mind for this post. Do I really mean that? Surely being flawless is not all it’s cracked up to be. It must be boring. You’d go through life making no mistakes. You’d have no happy accidents. I’m trying to think of a time when I made a mistake and things ended up turning out better than they would have had I not made the gaff. I’m not coming up with anything, but I’m sure it’s happened. I’ve got physical scars. My arms are scarred with scratches from my playful dogs. My abdomen is scarred at the place they opened me up to remove my uterus. Is there such a thing as an emotional scar? I could find some flaw in my personality, or a bad habit and call it a scar-a blemish on my psyche. The bottom line here is this: you get a scar because something that was cut healed. That means you’re alive! So go and get on with it. Today I learned that I shouldn’t get too attached to a project that isn’t mine. I also need to realize that for me, making a video is becoming an excuse not to write. I won’t become a better writer if I don’t write. Years ago, when I was in school, undergrad maybe; I had a day that was so chocked full of learning that I declared that I would not learn anything the next day. I said that in jest, but I think I really intended to give my brain a breather. You can’t not learn. As long as your conscious you are bound to learn something. If you watch tv you’ll see a commercial and learn about a new product. If you look in the mirror you’ll learn that there’s a blemish on your face that you hadn’t noticed before or that you have a new gray hair. Information is just flowing into your eyes, ears, nose and your skin all the time. Most of that information doesn’t get consciously processed, but a lot of it does. I’m no brain scientist, but I think some of the things we don’t think we processed get filed away and called up when we need i t.
Okay, that was my mini essay on learning. What I wanted to say in this post is that today I learned something about the way I learn. I found that if I’m trying to learn a procedure, and it absolutely confounds me, I am not going to figure it out by reading instructions that outline a similar procedure. I need to have someone show me something as close to the real thing as it can get. Now that was a blanket statement. There have probably been times when I’ve figured things out by seeing examples that weren’t quite so close to my particular problem. Today was not one of those times. Instead of continuing to bang my head against the wall trying to figure out how to do this thing, I asked for help. Voila, those little outlier dots got connected. I know what I’m doing now, so the hard work can begin again. That’s the moral. Don’t be afraid to ask questions. Don’t be afraid to look dumb, because it’s better to look dumb for a minute than to be dumb for a lifetime. I was looking for a brain picture. This reminds me of a brain. You can’t not learn. As long as you’re conscious, you are bound to learn something. If you watch tv you’ll see a commercial and learn about a new product. If you look in the mirror you’ll learn that there’s a blemish on your face that you hadn’t noticed before, or that you have a new gray hair. Information is just flowing into your eyes, ears, nose and your skin all the time. Most of that information doesn’t get consciously processed, but a lot of it does. I’m no brain scientist, but I think some of the things we don’t think we processed get filed away and called up when we need it.